One blessing we get through the blood of Christ is overcoming life. 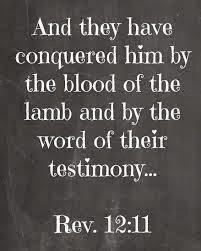 Through the blood of Jesus Christ we receive a life of overcoming sin, Satan, sickness (hereditary sickness, curse spells, witchcraft, childhood diseases, etc. ), fear of death, fear of the future, fear of disease, etc. In brief, the blood of the Lord Jesus Christ has a unique power that can enable us to overcome anything that is of the devil, world and sin. It is called the ‘blood of the Lamb’ and not, ‘blood of the lion’. In other words, as we are continuously washed in the blood of Christ, we are gradually being made lambs, being made meek and lowly. “And I looked, and, lo, a Lamb stood on the mount Sion, and with Him an hundred forty and four thousand…” (Rev 14:1). Those who stand with the Lamb of God must be lambs (in character).